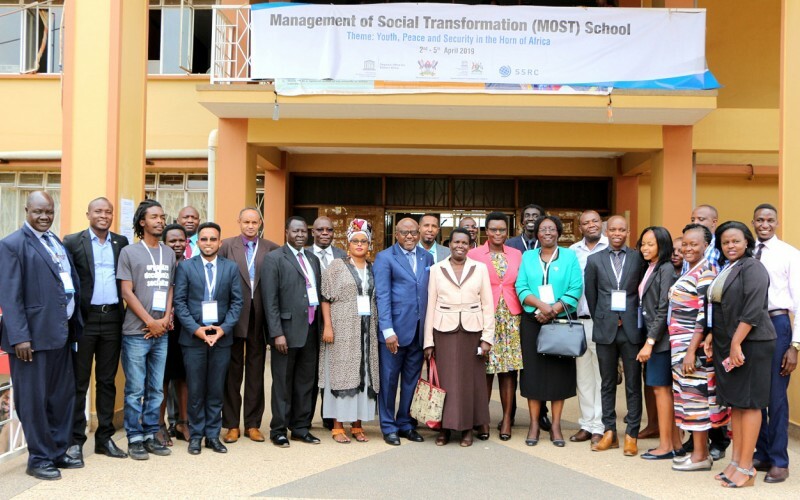 MAKERERE – Makerere University is hosting the 9th Management of Social Transformation (MOST) School. The event is bringing together youth leaders from Uganda, Kenya, South Africa, Somalia, Djibouti, Gambia, South Sudan, and Ethiopia and Tanzania to discuss the role of African youth in provide lasting and sustainable solutions to African Problems. The 9th MOST School was officially opened by the Minister of State for Higher Education Hon. Dr. Chrysostom Muyingo; represented by the Commissioner for Teacher Education, Dr. Jane Egau Okou on Tuesday, April 2 in the Makerere University Senate Conference Hall. Organized by United Nations Educational Science Cultural Organization (UNESCO) in partnership with Regional Office for Eastern Africa, Uganda National Commission for UNESCO and Social Science Research Council (SSRC), the four days’ event is running from 2nd -5th April 2019 under the theme: “Youth, Peace and security in the Horn of Africa”. The Management of Social Transformation School is an innovative capacity-building initiative under UNESCO’s MOST programme. The School is designed to strengthen the competencies of evidence-informed decision making for members States. It prioritizes interventions aimed at developing the capacity of researchers and decision-makers to transfer knowledge into action. According to the Secretary-General, Uganda National Commission for UNESCO, Ms. Rosie Agio MOST aims at enhancing knowledge brokering among youth leaders. “The programme is centered on young men and women who are both part of today’s reflections on socio-economic development and transformations and at the same time. These are the people who hold keys to unlocking the potentials of tomorrow’s peaceful, secure and inclusive world,” she said. MOST work together with governments, academic communities in the social and human sciences and civil society organizations; particularly youth-led and focused; to improve connections between knowledge and action. The Programme is tailored to meet the specific challenges of the IGAD Region. Within the Framework of the UN’s 2030 Agenda for Sustainable Development Goals and the African Union’s Agenda 2063, MOST contributes to development by focusing on among others; eradication of poverty, building inclusive societies, sustainable responses to environmental change, and promotion of participatory, effective, and accountable governance. In a speech read by Dr. Jane Egau Okou, at the official opening ceremony, the Minister of State for Higher Education, Hon. Dr. Chrysostom Muyingo commended UNESCO for developing a programme that is contributing to the realization of the Sustainable Development Goal (SDG) 4 in Africa. According to him, education is a fundamental pillar in building a formidable relationship between knowledge and action. Mr. Muyingo thanked UNESCO and the respective partners for supporting African countries to improve their policy-making processes. He applauded the organizers of the event and looked forward to the results and recommendations that can address the youth unemployment; a common challenge with serious implications on African peace and security. According to Dr. Sabiiti, Makerere has significantly contributed to societal transformation through human resource development, lead nurturing, and research and innovations development. This tremendous work from students and staff has provided lasting and sustainable solutions to African Problems. He, therefore, urged participants and MOST school partners to always link research to policy formulation. The Chairperson, Uganda National Youth Council Ms. Lillian Aber, called upon the youth to take a center stage in transforming Africa. “African peace strongly rests on the shoulders of the youthful population and it is, therefore, our role to ensure that we build lasting peace. It is our role as the youth to mobilize and be ambassadors of peace,” Ms. Aber advised.